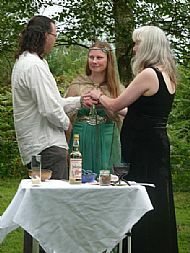 Handfasting is the ritualised tying together of a couple’s hands as a symbol of their union. This can be done with coloured cords (with the colours being symbolic of the elements or holding other meanings) or with ribbons (which could hold written messages or signatures from those at the ceremony). These are removed after the declaration of marriage and kept as a memento of the vows taken. The broom is a symbol of the home and can be used in a ceremony to ritually cleanse an area by brushing away harmful influences. It is also a fertility symbol. The jump across the broom during the wedding ceremony can be taken as crossing a boundary between the single and the married states. Other ‘boundaries’ that may be crossed instead of jumping the broom can be crossing a bridge over a stream, walking through a gateway (maybe into the marital home) or between two trees or other features in the landscape such as standing stones. The circular shape of a ring is symbolic of the cycles of nature and of eternity. Many couples choose to have their rings ritually blessed before exchanging them by presenting them to the four elements of earth, air, fire and water. If you own land – or even have a garden – the wedding can be commemorated by the planting of a tree or other significant plant to mark your union. This can be incorporated into the wedding ceremony with guests helping to dig the hole, water the plant, or even add pieces of paper with written blessings into the hole prior to planting the tree. Alternatively a pre-existing tree could become a ‘cloutie tree’ for the occasion with offerings and written blessings on pieces of biodegradable cloth tied to the branches. There are many beautiful poems and readings that express a bride and groom's feelings for each other. These can be incorporated into your ceremony and may be read by either myself or a friend or family member. Many couples like to involve others, particularly any children that may exist from a previous relationship, in their ceremonies. I have a selection of suitable readings that may be used or maybe you have your own favourites that we could use. The location of your ceremony can also inspire the content of your ceremony. I have had couples take their first steps into marriage by stepping into the footprint where ancient Kings of Scotland were crowned at Dunadd or walking a labyrinth drawn into the sand at the Silver Sands of Morar. So if you have any ideas or are getting married somewhere unusual then let me know and we'll see what we can come up with together! 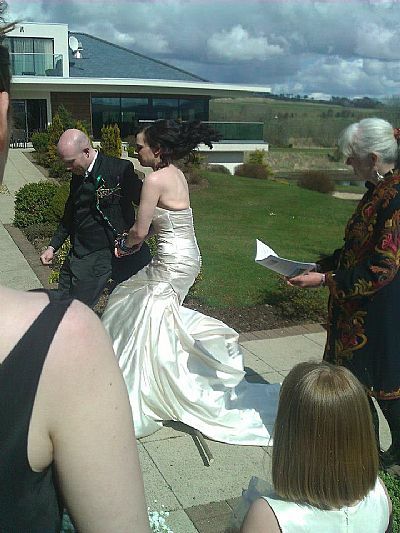 To be recognisable in law the ceremony must include a declaration by each of the bride and groom, in the presence of the Celebrant and their two witnesses, that they take each other to be husband and wife. This must then be followed by a declaration by the Celebrant that they are now husband and wife. Apart from that the content of the ceremony is all up to you. If having a legal wedding ceremony you will also need to contact the Registrar in the district you intend marrying in about 6 weeks prior to the ceremony to arrange a Marriage Schedule. This needs to be shown to the Celebrant prior to the ceremony so that all the details contained wherein are correct as the wedding ceremony cannot take place without this. More details on getting married in Scotland and all the relevant forms that need to be filled in and returned can be found here. It is your responsibility to arrange contacting the Registry Office and filling in all the relevant forms! One of 'my' brides is a qualified medical herbalist and made a series of short films for BBC Scotland. One of these features some lovely ideas for 'eco' or 'green' weddings and you can watch it by clicking on this link. The Dogs Trust are currently offering a scheme whereby instead of having conventional wedding favours you give small Dogs Trust branded momentoes to your guests and a donation to the Dogs Trust to carry on their work. Where and when are you planning to hold your wedding? Click here for some ideas to bear in mind when planning this. If you have any questions or would like to book a wedding ceremony then please do get in touch.